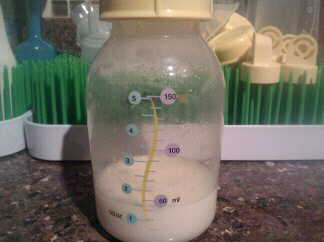 1 hour worth of pumping! Yay, after almost 3 weeks of my love-hate relationship with my Medela Symphony (I rented it), finally, this is the most I got (1.5oz from both breasts)! Even if this sounds pathetic to most EPing moms, I am just so happy this is the most I was able to express from me ;).